Use this page to request free copies of the Take Care of Texas materials listed below. Quantities are limited and we cannot ship to a Post Office Box. Please allow 7-10 business days for shipping and handling. Manual to familiarize individuals with the freshwater environment. Student Handouts - Instructors Guide with students of all ages. Introduction to the water cycle, aquatic life, and water pollution. Technical guidance manual for administrators on reducing waste and starting a school recycling program. Includes tips for Texas schools. Activity and coloring book for students in grades K-5. Dog mascots River and Sky help kids learn ways to care for the Texas environment. A catalog of educational resources for teachers, school administrators, parents, and anyone interested in environmental education. A bookmark with tips reminding young Texans to keep our air and water clean and save energy and water. Dual-sided in English and Spanish. Color poster (18" x 22") that illustrates steps in the water cycle and several human activities that affect water. Back of poster has narrative information on water as well as activities and puzzles. Educational poster showing how you can Take Care of Texas to improve environmental quality. Activities included on the back, such as a word search and a maze. Everyday measures the public can take to help maintain environmental quality in Texas. An infographic offering practical driving and vehicle-maintenance advice. Handy tips for recycling and disposing of waste. Handy tips for conserving water while saving money around the house. Handy tips for conserving energy while saving money around the house. General review of air pollution in the form of particulate matter. General review of ozone as an air pollutant. Brochure that details improvements in Texas' air quality with tips for the public on how to help. A short guide to recycling information available through various resources. A bill stuffer (3.5” x 5.5”) in English and Spanish featuring recording artists Kevin Fowler and Rick Trevino promoting the Take Care of Texas license plate. Bill stuffer detailing ways to save money and water. Bill Stuffer reminding Texans to conserve water. Display the Be Water Wise at Home and the When Less = More: Energy-Conservation Tips brochures using these publication holders. Helps you maintain a healthy yard, save money, and take care of our state's varied landscapes. Vinyl sticker (3.5" square) with the Take Care of Texas message, featuring mascots River and Sky. Vinyl static cling (4" square) with a water conservation message. 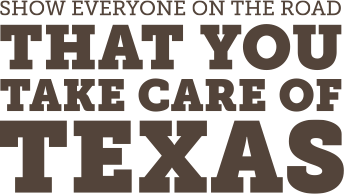 Texas-shaped sticker (4" x 4") with the Take Care of Texas logo. Bumper sticker (10" x 3") featuring the message Take Care of Texas: It's the only one we've got. Oval-shaped sticker (2.5" x 5") with the Take Care of Texas logo.